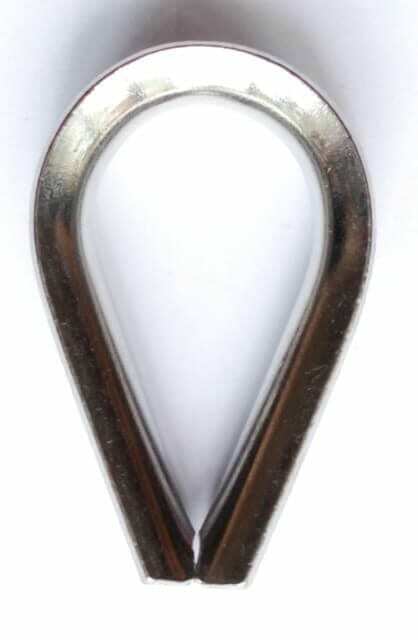 Details regarding stainless steel commercial pattern thimbles can be found on this page which is one of our products from the large range of wire rope fittings available on our website. Whilst you’re here, don’t forget to look through our diverse related product range to complement your thimble. Our great value range of stainless steel commercial pattern thimbles are designed for supporting stainless steel wire ropes and are perfect for domestic jobs as well as landscaping, sailing and installations. Because they are made from stainless steel they are perfect for outdoor atmospheres and severe climatic conditions because there’s no worry about rusting. These are available to buy in electro-galvanised as well as galvanised finishes. Groove widths vary in sizes from 2mm, up to 24mm for the fit you need. Ready to get your stainless steel commercial pattern thimble order to us? Thanks to our years of diligence and excellent customer service, Rope Services Direct are excited to provide stainless steel commercial pattern thimbles for any project you can think of. To let us know what you wish to buy, simply send us back a completed form via our contact us page. Got a burning question? All you need to do is drop our professional staff a line, dial 01384 78004. We are always pleased to help. Stainless Steel Commercial Pattern Thimbles Overall rating: 5 out of 5 based on 6 reviews.